Imagine a person with the emotional range of a terminator, the aura of Darth Vader and the Machiavellian mindset of Hitler. Now put her in a classroom. What you get is an unusual Japanese drama series that debunks the "heroic" teacher stereotype, presents searing commentaries about the state of the public school system, and gives you a character so evil and negative that the makers of the series had to show a clip at the ending transforming her back into just an actress. The show is called The Queen's Classroom and not for no reason. Sixth grader Kanda Kazumi (Shida Mirai) is looking forward to spending her last year in grade school having fun and creating lasting memories with her friends. But problems arise when a strict new teacher, Akutsu Maya (Amami Yuki) is assigned as their homeroom adviser. Maya ranks her class strictly according to merit, punishing harshly those with the lowest grades while lavishly awarding those with the highest marks. Soon, her high-handed ways lead to class dissension as the children are manipulated into spying on their own classmates, lying and bullying. Exactly, what lesson is Maya trying to teach? I watched this show purely on a whim. While I've seen quite a number of Asian movies, I haven't been paying much attention to their television counterparts. The Queen's Classroom is only my second foray into Japanese drama. The first was Engine, starring Takuya Kimura. Interestingly enough, both shows are primarily family-targeted dramas, although they are polar opposites of each other when approaching their respective storylines. The premise of The Queen's Classroom is nothing new. I have seen and read my fair share of 'strict adult vs. rebellious school kids' stories, growing up as I did on movies like Matilda and A Little Princess. So what makes "the Queen" different from the villainous grownups of all those other shows? Maybe it's the fact that Akutsu Maya, despite her name (aku is Japanese for "evil" and if you contract her name, you'll come up with akuma which means "devil"), is not what she appears to be. On the surface, she is truly frightening. She dresses up in entirely black clothes with a high-necked shirt and high-heeled shoes the sounds of which echo eerily in the hallways. Her hair is pulled back tight to show a face that is seemingly incapable of emotion. She never speaks louder than the normal speaking voice but she can CUT with her words. From the first moment you see her, the only conclusion you can draw is: DEMON. And the only worse thing about it is that she is probably the most intelligent, knowledgeable and talented person you have ever encountered and you are completely under her mercy. For Akutsu Maya excels in everything, whether they be academics, sports, music or martial arts and she expects you to do just as well. The character is probably one of the most fascinating anti-heroes I have ever seen on television in a long time. Right off the bat, there are only two other similar character types that I think would come up to par and one of them is an anime character. Not only that, the character is also one of the most effective in all her perceived purposes. Much may have something to do with how the character is written. The writers made no compromises whatsoever with Akutsu Maya. Even at the finale, when the melodrama reaches its peak, she remains absolutely in character. In fact, the only two times she sheds that mask happens in a dream sequence and at the final scene of The Queen's Classroom. However, no matter how good a character is written, it would all come to naught if the person portraying it can't deliver. Thankfully, we don't have that problem in The Queen's Classroom. Amami Yuki plays the character so well that when watching her I have no doubt in my mind that she is Akutsu Maya, with all her perceived faults and hidden sub-layers. By a less capable actress, the character would have been ridiculous. Indeed, there are plenty of moments in the series where the character is ungenerously treated as to make her an object of scorn rather than of a kind of deferential fear. They even went to the trouble of darkening the screen filters or flickering the hallway lights every time the character appears. That along with an unforgettable, flute-based operatic score almost always achieves the same reaction from me: hysteria. I always have this urge to laugh myself silly or run away in terror. The one saving grace is the actress' performance. You look at Amami Yuki's face and you know -- you just know -- that there's more going on there, like she's capable of great feats of self-sacrifice even at her most cruel, thus, achieving the writers' goal all along: that of creating a deep, multi-layered character whose intentions and aspirations won't be revealed until the very end. 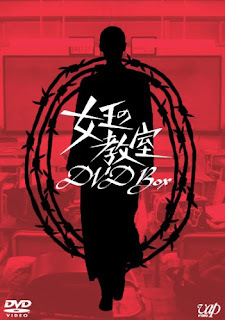 Aside from Amami Yuki (who is apparently no stranger to playing strong, manly characters), the actors and actresses in The Queen's Classroom, most of them under 15 at the time the series was made, display notable acting potential. The expressions may be a bit exaggerated at times. Shida Mirai (Kazumi) especially overacts in the beginning but as the series progress the actress is able to hold her own against the veteran Amami. In fact, the exaggerated expressions are an essential counterpoint to Maya's more or less blank wall. However when it's time to deliver the goods, the children prove to be more than capable. In fact, most of the emotionally-ridden situations in the show involve the kids while the adults are mostly there for comic relief. Believable performances of believable characters is a mark of a good show. But when you use this as a tool to deliver a relevant message, then you don't just have a good show but an excellent one. The Queen's Classroom comes very close by tackling highly controversial issues about the public school system. The series isn't just a story about kids trying to fight against the harsh system that their teacher imposes upon them but a bold commentary about the state of education today, bearing great relevance not only in Japan but in most other countries as well, not least of which is my own, the Philippines. Through Akutsu Maya, the show paints a harsh picture of reality and at the same time asks a question that fosters both initiative and critical thinking, as if to say: Those are the breaks. Now, what are you going to do about it? As the kids try to figure out the answer, we see the different faces of humanity throughout the show: there's the self-centered, the bully, the slanderer, the thief, the escape artist, the indifferent, the insecure, the smart, the mediocre, the optimist, the pragmatist, the dreamer, the advocate, and finally the admirable. At times, the series can reach so low that it makes you wonder about the message it's getting across, but that only makes you look forward to the bright little pockets of humor and cheer that come in equal abundance. Yes, The Queen's Classroom can be unrelenting in its portrait of the dire world but if you "open your eyes" you will see that nothing is set in stone and that regardless of anything you have a choice. Truly one of the finest television dramas I have ever seen in a while, The Queen's Classroom can be highly predictable with its simple plot, but what it excels in is its delivery. SIDE NOTE: I wish local television would pick this up, either buy the rights to air the series or adapt it in a Philippine setting. It's a really interesting show and it delivers a relevant message. It's not a love story so it doesn't have a lot of mass appeal but it's a family show and I think ABS-CBN has proved through May Bukas Pa that family shows can be crowd-pleasers, too. And if they do pick up this show, I can suggest only one actress to play the part of Akutsu Maya: Maricel Soriano. I know she's known for her "bungangera" roles. She can extend her range by playing a character who hardly makes any outward display of emotion without, however, appearing wooden. With Soriano's talent, I'm sure she can more than manage.